Cordless phones, microwave ovens, wireless motion detectors and video cameras typically operate at the same frequency space as Wi-Fi devices. Interference is one of the primary contributors to degraded Wi-Fi performance and reliability, causing flaky connections, dropped VoIP calls, and grumpy users. 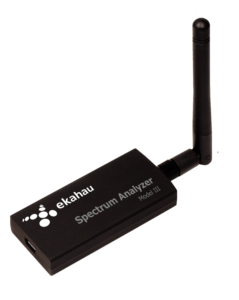 Ekahau Spectrum Analyzer is an accurate and easy to use USB device. It’s a great addition to any Wi-Fi administrator’s portfolio – without one, many Wi-Fi issues will remain unseen. 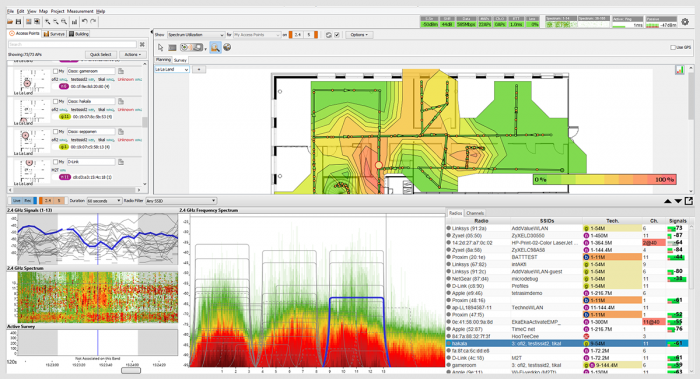 Ekahau Spectrum Analyser fully integrates with Ekahau Site Survey: While performing a site survey, spectrum analysis is performed simultaneously with active and passive surveys. No extra effort for gathering spectrum data. And no pre-configuration needed. It’s ready to go. Ekahau Site Survey also includes powerful on-the-spot and post-survey analysis capabilities. It combines both Wi-Fi and spectrum information into easy-to-read displays. Finding root causes for Wi-Fi problems has never been easier – or faster. In addition to Ekahau Site Survey interoperability, the Spectrum Analyser also comes with a stand-alone, on-the-spot troubleshooting application for in-depth spectrum analysis.